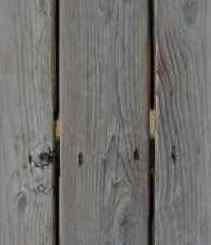 BEST TIME TO VISIT: Spring, Autumn, Winter. COMMENTS: All roads bladed by Park Service except road to Ubehebe Mine. 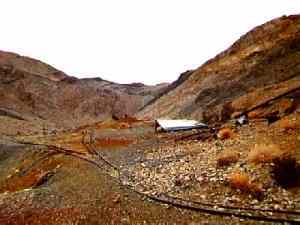 REMAINS: One structure, several mine portals with rails, air pipe, compressor air receiver, scrap, cans, cable tramway, stone walls, an old automobile body. The site of Salina City (also referred to as Latimer, near the Ubehebe Mine in the Racetrack Valley. 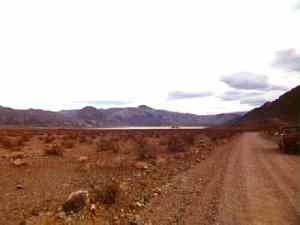 The famous Racetrack Dry Lake, with its mysterious "sliding stones" is in the background. 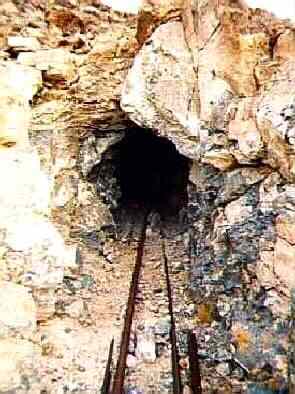 Another mine portal at Ubehebe Mine. December 1996. 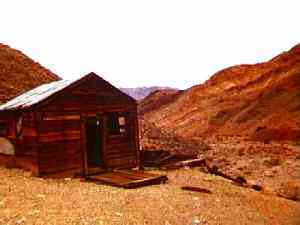 The only remaining standing structure at the Ubehebe Mine. December 1996. 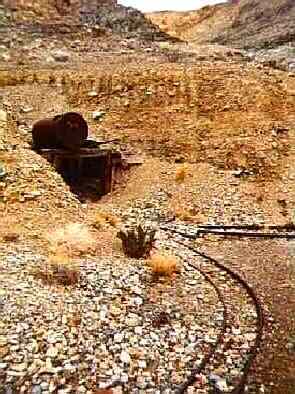 Tracks leave one of the numerous mine portals at the site of the Ubehebe Mine. December 1996.